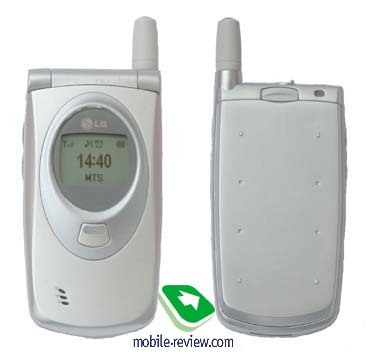 Several interesting elaborations are used in the new folder type phone from LG. 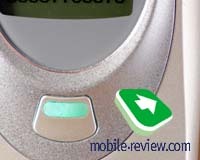 If you look at the phone with a closing folder you can see a small key with a call indicator light under the display. So the first peculiarity of the handset is that the indicator is placed on the faceplate as V-alert in phones from Motorola. You can set one of the 7 colours to LED. The second peculiarity is that this indicator is positioned on a front key. With a help of it you can quickly change the general profile to the silent one in the standby mode. Furthermore, you can reject an incoming call pressing this key. An outside display has a blue backlighting, the resolution of 96x64 pixels enables to display up to 2 text lines (11 characters) and 1 auxiliary line of icons. All information about incoming calls, new messages, alarm-clock displays on the outside screen, it is the main advantage of this display. You don't need to open the folder every time. There is a dynamic on the faceplate. The phone has a 40-tone polyphonic ringing. 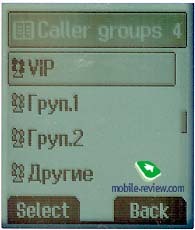 However, the same dynamic is used for the conversation and incoming calls. A twin volume key is placed on the left side. Handsfree car connector is on the upper side of the phone and a standard interface cutoff is on the bottom. Accessories from LG-510w are suitable for LG W5200, travel adapter in particularly. 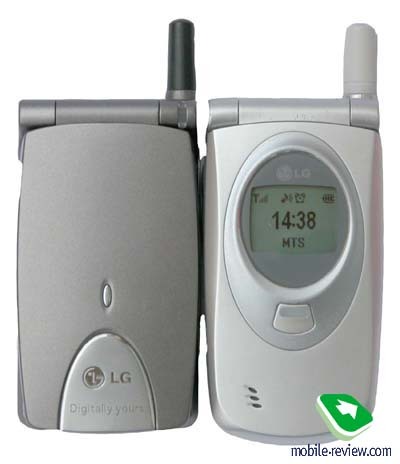 The phones are similar in a design, though LG W5200 is not so aesthetic. The dimensions and the weight are also comparable (W5200 - 84x45x19.5mm, 80g). It seemed to me that the new model weighs much more, though it is notable only while simultaneous weighing. 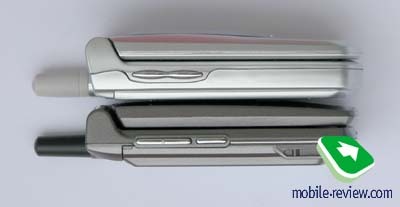 After opining a folder, you can find more similar features with LG 510, for example, an identical display. 128x160 pixels of resolution enable to display up to 7 text lines and 2 message lines. Blue backlighting provides a high visibility in darkness, it's easy to read the information from the screen. You can select a background picture in the standby mode (one of 6). Also you can set an animation (2 pictures) that displays while calling, switching on/off the phone, browsing the WAP. 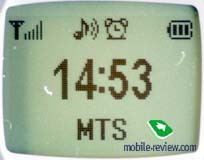 Such settings as the light-up duration, greeting message, the contrast of the screen can be regulated. A key-pad, made of plastic, is flush with a phone body. The keys are large, well-spaced, you fell no discomfort while typing. 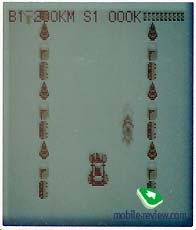 Under the screen one can find 2 soft keys, 4-position navigation key with a confirm key inside. What else? The phone has a Li-Ion battery of 750-mAh capacity. According to the manufacturer the battery provides up to 150 hours of work in the standby mode and up to 2.5 hours in the talk mode. In practice the phone worked 3 days in case of 15-20 minutes of talking (MTS network) and up to 10 minutes of using other applications (organizer, alarm-clock, games). The duration of re-charging is less than 2 hours. Interface is like in LG 510w. 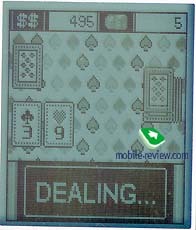 The specifications are also similar, some functions were added and some were remade in w5200. 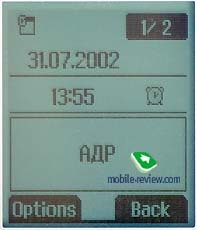 The operator, time, date and a sound profile are displayed on the screen in the standby mode. 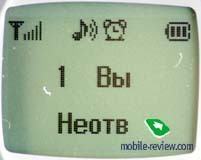 In the bottom you can also see explanations to soft keys, above - there is a line with icons which shows a signal level, a battery status (3 points) and an alarm-clock when it is turned on. To access a menu facility you need to press a left soft key. 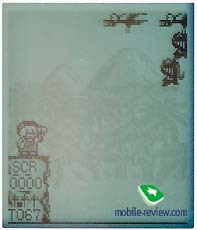 The menu consists of 8 submenus which contain several items. The structure of the menu is logical and rather easy. Icons are animated, they look nice. Since all items of the menu are numbered, quick access can be provided by shortcut numbers. The navigation key help to scroll all the lists of items, confirm key is used for entering the submenu and confirming the action. Let's view the main features of the handset. Phone book. 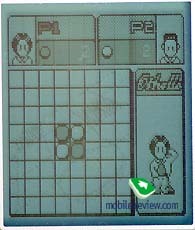 Phone memory capacity is 200 entries. You can save several numbers (mobile, home, office, fax) and e-mail for every name. Than it is possible to choose a special caller group for the entry (VIP, Family, Friends, Colleagues, Others and 2 additional groups). 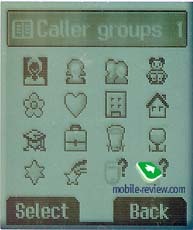 You can set a special ringing tone, LED colour and a specific icon to each group. The phone features are really great, but the entering is decisively disappointing. You should obligatory enter the mobile phone (the next field after the name), otherwise you can't access the following fields. You can't fill in only the fields you need. The other problem is connected with speed dialing. When you try to assign a phone number to the speed dial key choosing a name from the phone book, only mobile phones will be available for this operation. It's impossible to assign other phone types to speed dialing. You can add up to 10 voice tags to the entries in the phone book. Voice dialing feature works very well. The search function allows you to search a phone number either by name or by entry's position. 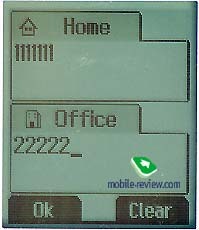 Both numbers saved in the phone memory and in the SIM-card memory are displayed at the same time. Messages. 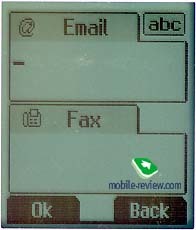 The phone supports messages that have up to 1024 characters. Choosing a caller group as address you can make a message posting. There are 11 templates in the phone, 6 of then are pre-defined but can be edited. 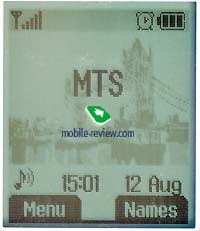 The phone has a special memory for 100 short messages, SIM-card memory (for 10 messages, as a rule) is also available. It's easy to input the messages by using predictive text input eZi (Russian, English). It is analogous to T9 and works the same. There is no problem to change Cyrillic and Roman letters quickly, just press and hold #. This key also helps to change a letter case and to switch on to figures. According to the manufacturer, there is a support of EMS standard in the phone but I couldn't find this feature in my sample. Call register. 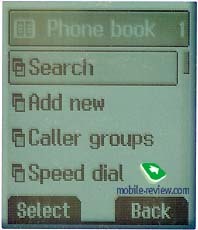 This submenu allows to view lists of incoming, outgoing and missed calls. Each list contains up to 20 records with time and data of the call. Here you can also view a duration of the last call and a total time of all calls. Profiles. 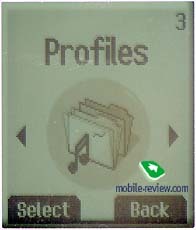 In this submenu you can customize different profiles: set the ringing tone, sound volume, turn on/off vibrating alert. There 20 polyphonic melodies in the phone, also you can download 3 of your own. Settings. As in phones from Nokia, the first item is alarm-clock. The repeat period can be different: once, daily, weekly and monthly. If you set Yes to in Power off alarm the alarm-clock will sound even if the phone is switched off. It is impossible to set a specific tone to alarm-clock. Data, time, the phone settings while opening the folder (activation of voice dialing, answer mode), audible timer or minute minder, all these things are set in this submenu too. Here you can view display settings (see above). The engineers didn't add a preview of wallpaper. As before you should set a picture, than exit the menu and only after that decide whether you like it or not. Call divert. A standard feature, nothing extraordinary. Scheduler. 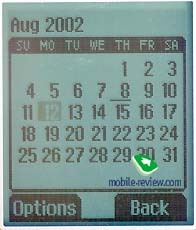 The calendar can store up to 20 events. You can view them by month. When the memory is full, you should delete old events to add new ones. It is possible to set a repeat time for each event (once, daily, weekly, monthly and yearly). No other features. Accessories (Full&Tools). You can view the time for each city around the world in the submenu World time. 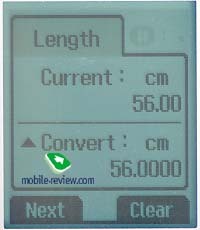 Calculator and unit converter are also placed here. It's easy to convert inches to centimeters, for instance. Also you can find 5 games. Internet. Wap-browser (version 1.2.1) is positioned here. It works without problems. The quality of connection of this phone is the same as in LG 510w. It worked rather well, sometimes there were problems in the fringe areas. The volume of dynamic is high, but be attentive when you put the phone near the ear. Small deviation and the sound isn't so clear. But in the whole the impression is positive. The main drawbacks are badly organized work with a phone book, small volume of memory in the organizer. The advantages are the availability of the front key on the faceplate, good interface and entrance location, 40-tone polyphonic ringing. A strong vibrating alert is also an advantage. It's necessary to note that both sides of the phone are vibrating when the vibrating alert works. That's why you can feel it excellent. There is a Dictaphone (90 sec.) in the phone, it works only in the standby mode (pressing C). It's hardly possible to consider this phone cheap taking in account its price (360$), but you should remember that's LG w5200 is the first phone with a 40-tone polyphony. Other features are the same as in LG-510w. But the latter doesn't have a second display, hence, its price is lower. 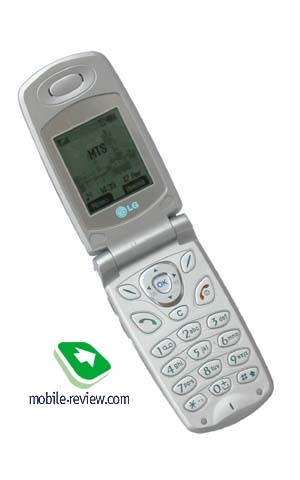 I can recommend LG w5200 to those who like folder types of phone and who are interested in 40-tone polyphony. 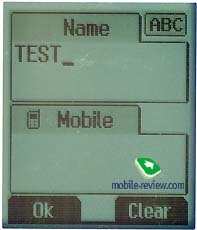 Remember that the phone doesn't support the data package exchange (GPRS) and Java, though some advertisements have this information.